when I deserted you and the rest of the film crew during the shoot at the duckponds of the Auckland Domain last Saturday, I wasn’t just looking for an ice cream. I was investigating the Domain’s Wintergardens, in case we wanted to film them, after we’d finished with those duckponds and with the ruined railway workshops in the park’s bushland. 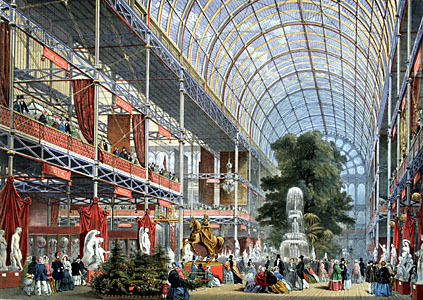 We have talked in the past about a possible link between the Wintergardens, with their high glass ceilings and open interiors, and Crystal Palace, that symbol of Victorian imperialism built for the Great Exhibition of 1851. For the millions of visitors who wandered through Crystal Palace’s interior, blinking at sunbeams sharpened by the thick glass of the building's walls and ceilings, the Great Exhibition represented an inventory of the world’s resources, and a demonstration of British ingenuity. The Crystal Palace lacked the complicated spaces – the small rooms and hallways and antechambers and stairs – of more traditional European buildings. Because its vast central space was undisturbed by permanent internal divisions, it could be filled with almost any sort of object or activity. Arguably, the abstract spaces of the Crystal Palace were the corollary of the increasingly abstract quality of capital, in the age of burgeoning imperialism. As the English ruling class invested in Ceylonese tea and New Zealand sheep and Guyanese timber, the old counters and symbols of wealth – gold, livestock, the country pile – were being superseded by the numerals that flowed through banks and stock exchanges. Like capital, the Crystal Palace could continually reinvent itself. The same room that held a collection of early English-language Bibles – the wine-stained portable churches of the Lollards and Wycliffites, with their innumerable errors of spelling and interpretation – could, in a few hours, be made to display a collection of garish, obscenely-shaped flowers from Guyana, or a set of silks from the East Indies, or a lovingly dismantled, carefully polished train engine from Manchester. We are interested in the Domain because of the role it played, in the late 1850s and ‘60s, as the showpiece and arsenal of Auckland’s Acclimatisation Society. As the Crostopi Manifesto pointed out, the Domain’s duckponds and the gardens that once surrounded those ponds were the site where the species that would transform the landscape south of Auckland were planted and drilled. Strange fish writhed and flashed in the ponds, while blue ducks patrolled their surface; plants garnered from different zones of the British empire flourished or expired in the flowerbeds that had been raised around the water. When General Cameron took his army into the Waikato Kingdom, crossing the border King Tawhiao had made at the Mangatawhiri Stream, the species barracked at the Domain were not far behind him. As the soldier-settlers of the Waikato waged war on the land they had confiscated from Tawhiao, draining eel-swamps and making them into cattle pastures, felling kahikatea for fence posts, and ploughing hillside pa into croplands, they found allies in ducks, trout, rabbits, and other exotic species. As James Belich has shown in his books Forging Paradise and Replenishing the Earth, the men and women who colonised New Zealand in the middle decades of the nineteenth century were ardent futurists, intent on using technology to build a ‘better Britain’, a utopia of the south. In many ways, the soldier-settlers who founded utopian communities like Cambridge and Morrinsville were far more modern than we are today. Like the imperialist businessmen who funded the Great Exhibition, they wanted to transform not only the human but the natural world, by creating new ecosystems and new landscapes. By the time the construction of the Domain’s Wintergardens began in 1913, though, the history of imperialism had entered a new phase. In New Zealand and in the Home Country, fantasies of fantastic wealth and untramelled progress had withered. Trade unions and suffragettes were rioting in the streets of Auckland and London and Liverpool in the name of social revolution, and rival imperialist powers were drilling armies in central Europe. The construction of the Wintergardens was completed in the years after World War One, that four year indictment of European capitalist civilisation. It is not surprising, then, that the Wintergardens, and the many similar indoor gardens erected in postwar Britain, are a step backwards from the hubris of high Victorian architecture. The Wintergarden’s glass is supported not by steel, that symbol of the industrial revolution, but by bricks arranged in the shape of a barrel. Where the Acclimatisation Society housed its species in the open air, as if encouraging them to escape into the barbarous spaces of Aotearoa, the Wintergarden’s temperate and tropical rooms were and are carefully separated from the rest of New Zealand. By the 1920s, optimism about the ability of humans to transform the earth for the better had been replaced, in New Zealand at least, by nervousness about the impact of exotic flora and fauna on traditional landscapes. Farmers complained of hills collapsing after tunneling by thousands of rabbits, and of gorse and ragwort marching like rebellious armies across acres of pastureland only recently taken from the bush. In the twenty-first century, tens of millions of dollars are spent every year preventing exotic species entering New Zealand, and millions more are spent on a struggle against nineteenth century imports like the rat and the possum. Where the imperialists of the nineteenth century deprecated the indigenous and celebrated the exotic, their descendants do the opposite. Sociologist Bruce Curtis has noted the way that the kiwi, an animal regarded with contempt in the nineteenth and early twentieth century, was adopted as a symbol in the 1960s and ‘70s by a Pakeha population keen to assert its supposed indigenity. With its collections of exotic flowers and its pleasant ponds, the Wintergardens is a popular part of the Domain. Couples kiss and negotiate on the long benches beside the ponds; elderly ladies and giggling toddlers breathe in the strange scents of the tropical room; botanists aim the long snouts of their cameras at particularly rare or garish petals. But the appeal of the Wintergardens rests on its exoticism, and on the strength of the distinction, in twenty-first century New Zealand, between the exotic and the indigenous. Where visitors to the Domain of the 1860s were excited by the notion that the species being nourished there would soon be unleashed south of the Mangatawhiri, and become part of the New Zealand landscape, visitors to the Wintergardens come to see plants that will never be part of the local landscape. In recent years, the management of the Wintergardens has sought out and exhibited plants that appeal to the horror of the exotic that has is such a feature of twenty-first century Kiwi consciousness. Last year, for instance, they were able to procure and display a titum arum, which is native to the jungles of Sumatra and smells like a decomposing cadaver. The ‘corpse flower’, as it is popularly known, attracted large crowds, as Aucklanders sniffed and grimaced at the strange visitor from a distant and dangerous world. Last Saturday, as you were trying to wrap up that shoot at the duckponds, I wandered around the walls of the Wintergarden’s tropical room. The rows of red bricks reminded me of an Edwardian prison or asylum, and as they pressed their faces against the panes of fogged glass that stretched between the brick, the species of the tropical room suddenly seemed like bewildered captives, staring out at the world that would no longer admit them. I’ve attached a couple of photographs. The English admit that, at the industrial exhibition, the Americans carried off the prize and beat them at everything. 1. Gutta-percha. New materials and new industries. 2. Weapons. Revolvers. 3. Machines. Reapers, seed drills and sewing-machines. 4. Daguerreotypes, used for the first time on a large scale. 5. Shipping, with their yacht. Finally, to show that they are also capable of producing luxury articles, they exhibited an enormous lump of Californian gold ore and beside it a golden service of virgin gold. The museum is good, my grandson loved it when I used to take him. The best with your epic! You have to have Hamish in it and Jack (he's in everything else)....I suppose there is an interesting link for me in that my father knew R A K Mason, he encouraged Hone Tuwhare and we both worked (in different times) at the Railway Workshops and I at the Freezing Works. I like the idea of it (I mean your project, I doubt if many people will want to hear and old man such as myself ranting on) a reverse one (later date?) would be a saunter down (or up?) the Waikato. We (well in fact all nations really) are a nation not only of the sea but of rivers. Coincidentally, this morning, I was reading a book about Prynne etc and my book mark was a poem ( a bit naive) "about" the land question etc, but realised such a thing, good as it sounded as rhetoric, was more complex (what is land? who ever owns it and how? how should we see or say who "really are" the original people. In a wider sense we all are. I suspect though you don't have any overarching principle which will make it the more interesting. All artists: Prynne, Brunton, Janman, those Tongan artists and other Oceanic or Pacific artists, all are driven by ego: given that the artist can 'lose him/herself'. To offset any hint of "glamour" or "popularity" you could put ugly and bitter drivelling old bastards like me who don't ever really know what or who they are talking to or about as a kind of "statement".